I hope that we have all become situated into our college lives, classes are going smoothly and we aren’t extremely homesick. To hopefully cheer you on, think of the fact that we only have 63 days until December 6th, the last day of classes! It seems that we have just started school last week. Can you believe it that we have been college students for 41 days? My fellow freshmen, just 63 more days and we can officially proclaim that we have been in college for a whole semester. Speaking of semesters, I do hope that we all are on the right track, as far as grades are concerned. If you feel that a class just isn’t for you, you still have a bit of time until the deadline to withdraw from it. That date is Monday, October 24, 2016. Keep in mind that you will have that “W” on your transcript, but that beats a terrible grade any day. As you probably know by now, college life moves at a quicker pace than high school life. Prioritizing, balancing and managing are skills that we all have to master at one point or another, and there is no better time than the present. If you haven’t by now, I would recommend buying a planner or downloading a handy app for your mobile device. I, for one, have an app on my phone that syncs to my computer, a hand-written agenda, a desk calendar for work, and a dry-erase calendar hanging over my desk in my dorm. I know some who only have occasional reminders on their phone. Whatever works for you works for you. Just find it and stick to it but adjust it when need be. Adjusting goes hand in hand with balancing, and balancing everything that life may throw at you becomes a skill that you wear with honor. I have come to understand that I am quite good with deadlines, so my academic life is where I want it to be. However, having the best of both worlds is something that life is not allowing me at the moment. My social life seems to be suffering due to my good grades and that is one sacrifice that I am more than willing to make. Managing may mean sacrificing. We know that stress is to college as naps are to babies. This means that the stress you are feeling is almost second-nature. Although natural, do not ignore it, take care of yourself and keep moving forward. You may just need to drop something that is causing you stress, whether it be a person, a class or a situation you find yourself in. Whatever is causing you to feel less like yourself is not worth keeping around. For those of us still learning, it is vital to recognize when we need help. This can be academically or purely mental. I know the best advice I have been given up to this point is to “take care of your mental health because without it being at its best, everything else crumbles.” I know the best of us needed this Fall break more than we knew. I know I needed to see my mother and push my nagging responsibilities out of my mind for a day or two. As for the remaining day of Fall break, a nap, see family, visit the Counseling Center, indulge some Insomnia Cookies; take care of yourself. 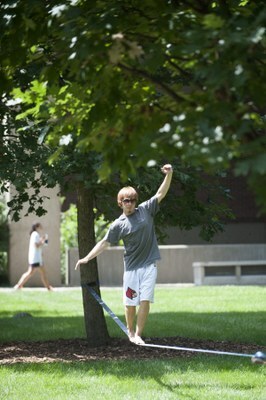 Want to see what UofL is like for yourself? Future Cards and their families can visit campus on October 15 for Cardinal Preview Day! Take a campus tour, attend an info fair with various academic units, see workshops on scholarships and financial aid, and visit campus open houses. Click here for more info.